BSkyB, a long standing client of co2balance, have made a bold statement transforming their professional cycling team to highlight their environmental initiatives. Many co2balance customers choose to work with us as part of their overall environmental strategy. Media giant BSkyB have been a client for a number of years choosing co2balance to calculate the green house gas emissions related to many events and business processes. Many of these are low key events and as such are part of what BSkyB do to support their commitment to the environment. This time it’s right out in the open. This year Team Sky, the BSkyB professional cycling team, will be turning green at this year’s Tour de France to help save one billion trees in the Amazon rainforest. In addition to raising the profile of BSkyB’s rainforest program the total carbon footprint of the team participation will be measured and offset by UK based co2balance making team sky the first CarbonZero team in the tour. Team Sky’s kit, bikes, equipment and vehicles will change from blue to green for all 21 stages of the race to help raise awareness and support for Sky Rainforest Rescue, a three year partnership between Sky and WWF to help save a billion trees in the state of Acre, northwest Brazil. Dave Brailsford, Team Sky Principal, said: “As a team we saw the opportunity to change our bikes and kit to green as the perfect way to raise awareness of Sky Rainforest Rescue amongst the Tour de France’s millions of world wide fans. The nine Team Sky riders competing in the race – Edvald Boasson Hagen, Juan Antonio Flecha, Simon Gerrans, Christian Knees, Ben Swift, Geraint Thomas, Rigoberto Uran, Bradley Wiggins and Xabier Zandio – will ride specifically created green Pinarello bikes. Their entire kit will change from blue to green including jerseys, sunglasses, helmets, water bottles, saddles and they will be supported by branded Jaguar vehicles and even a new look team bus. Team Sky is working with CO2Balance to invest in projects that will save equivalent amounts of carbon to those created by the team’s participation in this year’s Tour de France. In addition, cO2Balance are helping Team Sky to bench mark total emissions for the season with an aim to ensuring year on year decreases in team emissions. Case Study co2balance in the community – In their own words. One of the Gold Standard projects our customers have helped to support is in the Kisumu District of Kenya. Living and working within the communities our education officers help to coach the householders to get the very best out of their new efficient stoves. co2balance education liaison officer, Wycliffe Churchill Odumo talks to some of the residents of Eastern Kisumu, a busy project area in the West of Kenya, about their experiences with the new stove. In their own words they explain the impact this project has had on their lives. Quotes from: Lillian Akoth Opiyo, Philgona Akinyi, Agnes Akinyi and Alice Awino Otieno. Residents of the project area in Kisumu West. Lillian: “I’m a mother of five school-going children of which four are day scholars in nearby primary schools. One is in a boarding secondary school. I stay with two other female relatives and everyone in this household has learned to operate and cook on the good stove because it is effortless to light, smoke free and saves fuel. Before the project began in this area, I had sleepless nights particularly during rainy seasons thinking hard on where to get good cooking wood fuel for in this community it is highly priced and hard to come by. There are no free or communal fuel collection points and this means that collecting even a dry twig along the neighbors’ fence can create a serious conflict”. Alice: “There isn’t just enough fuel out there. I have to say that the stove has helped us to utilize every little available fuel. I value it so much because it meets my cooking needs and is suitable for use even with fuel from the shamba(farm). We were trained on the cooking process which enabled us to use sources of fuel such as dry maize stalks and maize cobs from our farms. Nowadays, whenever we harvest, we dry and keep them back. The stove works well with them. I am happy to say that never before had I seen a project done in a free and fair manner like this, we accept it and are proud to have been selected as beneficiaries. We wish that everyone benefits”. Lillian: “Previously, with the three stone stove, I got reluctant to cook some meals because the quantity of fuel I had was scanty. Now I’m not worried because with just three to four pieces of medium sized fire wood, I am sure of cooking entire meal”. 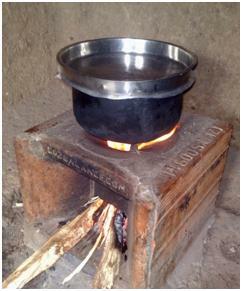 Philgona: “This stove is decent and pleasant to cook on and members of this household have learned how to operate it. Imagine (cites her siblings name) Agnes and Catherine too know how to cook on it as I do”. 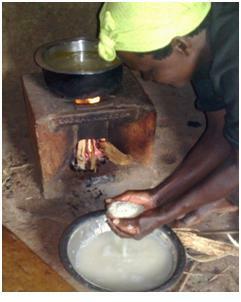 Alice: “I also don’t want to waste fuel so I follow the cooking manual that I was given. It has been handy in organizing my cooking sessions so that I get optimum value of time I spent searching fuel and is indispensable”. hallenge we were facing on fuel. Once I received it, I realized that it is decent, efficient and fuel effective. It meets my expectations in the kitchen in terms of cooking. No more haphazard use of fuel. I also experience less chest problems such coughing and eye irritations”.